The Spitfire, or Submarine Spitfire, was first used by the Royal Air Force during WWII as a short range interceptor aircraft. It was one of the only planes to be in continuous production throughout the war, and there is still over 50 Spitfires considered air-worthy today. 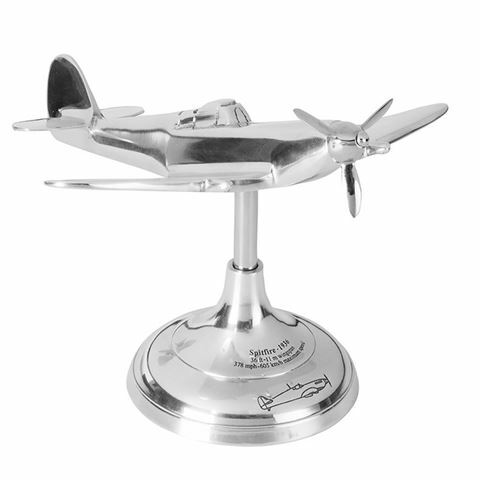 The Desktop Spitfire is a replica model of such aircraft, and is a lasting accessory for your office desk or mantelpiece. This dedicated model is crafted from aluminium that is polished to shine, and features a realistic spinning propeller on the nose of the plane, which makes it the perfect decorative piece for anyone with an affinity for history. Made from aluminium with a polished finish. Spinning propeller on the front of the plane. A replica model of the traditional Submarine Spitfire from WWII. The model screws on to a convenient stand. Stand is engraved with specifications and interesting facts about the original Spitfire plane. Dimensions (Including Stand): 22cm (l) x 14cm (h) x 19cm (w).